Monumental. 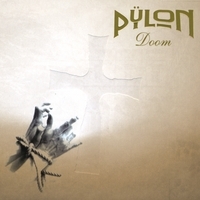 If I had to pick one word to describe Doom, the third full-length from Switzerland's Doom Metal duo known as Pÿlon, that's the one I'd choose. Matt Brand (guitar, vocals) and Jan Thomas (bass, flute) teamed up with no less than 5 drummers and 3 guest guitarists to create a work of epic Doom Metal that rivals classic releases from St. Vitus, Candlemass, and Count Raven. The album's first track, the lumbering "Renovatio", encompasses the essence of what Pÿlon is all about. With the help of some truly sorrowful solos from Sandro Keuson (Trinity) and some fine, progressively-styled drum work courtesy of Martin Roth (Crown of Glory), the song enshrouds the listener in feelings of despair and anguish as Brand's forlorn vocals seem to come from beyond the veil of Death. Brand and Thomas are motivated by exploring the theme of death, in particular death as a result of absolute despondency, and the meaning of what lies beyond it. They've ably reflected this theme in their lyrics and in the overall gloomy mood their music invokes. One of the aspects of Doom that impresses me most is how consistent the album is even though each song incorporates enough variation to be clearly distinguishable from its neighbors. In theory, the prominent use of the ecclesiastical organ on "Ho Theos Erchestai" should clash with the Viking Metal vocals and raw guitar tone of "Psych-Icon", but in reality the ever-present undercurrent of despair weaves all of the unique threads together in one masterful tapestry of depression. A major factor in the cohesive quality of Doom is the vocal performance of Matt Brand. He's not one to overpower the instrumentation with his voice, and instead falls into step with what is happening musically. Oftentimes his cleanly sung, slightly monotone style is processed to sound as if he's haunting the listener from beyond, which heightens the effect of the music. He occasionally deviates from the norm, however, with "Ho Theos Erchestrai" finding him sounding a bit like Ozzy did on "Mr. Crowley". "Beneath, Beyond" features a monastic delivery style, while the Death Metal growls of Pÿlon's previous work creeps in again on "DeadLove". Brand's crushing, mournful riffs are also a key to Doom's success. Augmented by some rather impressive soloing and lead work from other guitarists of the Swiss Christian metal scene, he joins with Thomas' bass to consistently belt out slow to mid-paced despondency. While always lurking just beneath the surface, Thomas emerges with a strong lead on "In The Shade" as Brand goes a little retro with his riffs. This track also finds Thomas introducing his skills on the flute, lending an extremely sorrowful quality to the song that resurfaces on "Beneath, Beyond". Two of the songs that do tend to stand apart from the rest, though they are in no way out of place, are "Dream A Dream" and "An Angel Tale". The former, with its plodding, belligerent riffs, sounds like something out of a David Lynch film but remains no less heavy than any of the other tracks on Doom. "An Angel Tale" is the most Gothically styled track on the album, with highly atmospheric keys coupled with acoustic leads and crunchy up-tempo riffs lending a bit of a late period Sentenced sound to the song. Despite the Christian overtones in the lyrics and in the very professional packaging, Pÿlon has released what is unarguably going to be one of the best Doom Metal albums of 2009. Fans of heavy, atmospheric, mesmerizing Doom Metal absolutely must add Doom to their collection post haste.